Le’Joy White, Alyssa Luna, and Shelby Dance, current and former student success advisors in University College, led life-impacting trips promoting community outreach and engagement with undergraduate and graduate students. 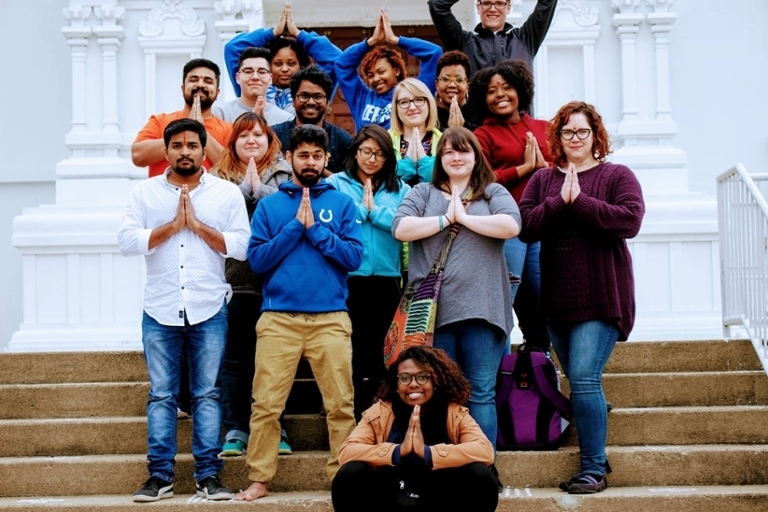 These trips encouraged students to learn about community needs, specifically in Pittsburgh, Pennsylvania, and St. Louis, Missouri, and focused on mental health as well as the intersection of gentrification, food deserts, and systemic racism. Le’Joy led the team focused on food insecurity. For many in her group, it was their first time to Pittsburgh. The team worked with multiple community partners, including the Pittsburgh Community Foodbank and the Pittsburgh Project. Le’Joy reflected on a special time when her team volunteered with the Pittsburgh Project. They had the task of cleaning the Pittsburgh Project’s kitchen, which seemed insignificant at the time; however, Le’Joy notes the amazed and appreciative response the Pittsburgh Project had toward their efforts and how this helped her students build relationships with the people of Pittsburgh. Le’Joy wanted her students to understand the people of Pittsburgh and the responsibility they have toward the Pittsburgh community. She felt their interaction with members of the Pittsburgh Project helped fulfill this goal. The students “have an understanding of the people of Pittsburgh, and often times we come in and want to save communities and that’s not our job. Our job is to come in and better understand what the community does, what they have, what they don’t have, and then ask the people, ‘what do you need?’ before we jump in and just try to fix it.” Le’Joy wanted her students to be sensitive to the communities they entered into and to make sure they were being educated, rather than domineering, and she was not alone in this perspective. Alyssa had the same idea, but her group focused on gentrification. She explained that this trip was a critical service learning experience that emphasized the importance of not just doing volunteer work but also actually learning about the issues. Alongside Le’Joy’s group, Alyssa’s team worked with the Pittsburgh Project, observing the significance of small efforts with a big impact. Her team also partnered with the Greater Pittsburgh Foodbank and the Hazelwood Initiative by working in houses, cleaning kitchens, and continuing to build relationships with the Pittsburgh community. Shelby led a group to St. Louis, Missouri, that focused on the topic of mental health. Her group participated in multiple educational experiences from presentations by speakers and doctors in the community to viewing documentaries. Her group also participated in discussions reviewing studies of childhood experiences and their intersection with individual and community mental health. The team worked with multiple community partners, including Payroll, Health, Response (PHR), a suicide call center for teens; Supporting Positive Outcomes for Teens (the Spot); and Communities Healing Adolescent Depression and Suicide (CHADS). Knowing mental health struggle personally, Shelby led this trip to address stigmas students with mental issues face to provide them with further education on mental health issues and to give hope to students dealing with mental health issues at IUPUI. Le'Joy White details her and her group's experiences during the trip to Pittsburgh. Alternative spring break trips are planned by students who are awarded the Sam Jones scholarship. Trip leaders and assistant trip leaders choose trip topics, service locations, and trip locations. These leadership opportunities give students the chance to develop leadership skills and to provide them with leadership experience to add to their resumes, as well as providing a life-altering experience that allows students, staff, and faculty to work together outside of the classroom. Visit the Division of Student Affairs page to learn more about how you can participate.